Previously: RealiMation the Datapath Years, Part 1. We started getting involved with companies and civic organisations wanting to present virtual worlds to their organisation or the public via very large projected displays and often in stereo. So it saw a period of relatively intense development of the stereo and multi channel display code. Looking back I now realise that all the work we did subsequent to this in this area was really just enhancements, tweaks and eventual reimplementation in what would become mantra4D. This area ended up becoming my specialty, and I must say I enjoyed this aspect of the work immensely. There were two types of stereo display – what we called active stereo and passive stereo. In the latter the left and right images were projected on top of each other through polarised (or eventually coloured) filters and the viewer wore appropriately polarised (or coloured) glasses. The former was more complicated as special hardware was needed to go between the computer and monitor. The display would consist of alternating left and right eye images at 120Hz and the user would wear LCD shutter glasses which alternately open and close each eye and are synchronised by an emitter on top of the monitor. This is the technique being used by the latest 3D graphics cards from nVidia and AMD/ATI and hasn’t really changed in the last 10 years. For one particular active stereo implementation I had to devise a way of controlling the vertical sync signals across three (or more) monitors fed through VGA cables for multi channel active stereo systems. Keeping the displays synchronised is quite a complicated process. The outputs from the graphics cards need to be kept in step. At the time there was only one card that could do this, which unfortunately I can’t remember now. In addition the vertical sync signal going into the monitors must also be locked together. Otherwise the displays would refresh at slightly different times and the 3D effect would be ruined. With BNC cabling it is easy as the sync cables are separate from the RGB colour cables. In VGA cables you can’t get at the individual components without breaking into the cable. So we attacked the problem where there was a natural break – at the plugs and sockets. We devised a bar that had male and female VGA connectors on either side. All the pins on the male connectors, apart from the vertical sync signal, were connected directly to their counterparts on the female connectors. The vertical sync from one input was treated as the master and fed to all three outputs. This ensured that the three monitors refreshed together. After all that effort I think we only ever installed one – in Helsinki. The biggest drawback of active stereo systems is that each viewer has to wear a pair of the shutter glasses. These are expensive and only a few people could view the image at any one time as the image and field of view are relatively small – being restricted to the size of a monitor. The emitter that controls the glasses also has a limited range and field of operation. Modelling cities and being able to fly through them in real-time was (and I suppose still is) a common application. Before I joined there was a model of Philadelphia created in MicroStation and exported to RealiMation. Later on there was a contract to model of the City of Rennes and DaimlerChrysler were looking at modelling all of Stuttgart, as well as their factories, as a PR exercise. They got some way to doing this, but due to the size of the models they began to hit some hardware limitations. Passive stereo systems eventually proved to be far more popular. These could be viewed by many people through relatively cheap glasses and have a much larger image (8’ high in many cases). As projector technology improved we were able to supply systems that projected higher resolution and brighter images from increasingly (or should that be decreasingly) smaller units for a progressively less and less money. “Shrinkage” of the glasses stock was still a problem, but very much less so with the polarised lenses. It potentially became more of a problem with the more expensive red/green filtered glasses, but as these systems weren’t usually installed in public places it wasn’t really an issue. Mike ported the libraries to the Dreamcast (a games console) for a company called Cross Products, but nothing really came of this. I think that this was another of Brett’s abortive attempts to get into the games industry. While it was interesting, in hindsight I realise it was always a dead end. The RealiMation concept of safe access to the model and real time rendering (rather than constant frame rate rendering) meant that the libraries were always going to be unsuitable for game delivery. We wrote a set of technical papers dealing with various aspects of creating simulations with RealiMation. These went from the basics of how to create an application to more advanced techniques for representing weather and explosions. I thought I had copies of the final versions of these but that turned out not to be the case, so I only had older versions culled from the Wayback Machine archive and I was missing a couple. But thanks to Greg Whitfield I now have a full set and I’ve posted them. To go alongside these we also wrote a series of mini applets which we bundled together and presented via a user interface that was unashamedly influenced by Silicon Graphics. I actually have the code for this so I’ve decided to make it available as a zip file. We called this RealiMation Showcase – we were always coming up with grandiose names for products ;). If you do download and run it, please bear in mind that it’s over 10 years old. This was the first outing for many of the techniques we refined for later applications. Click on one of the buttons (not Exit!). 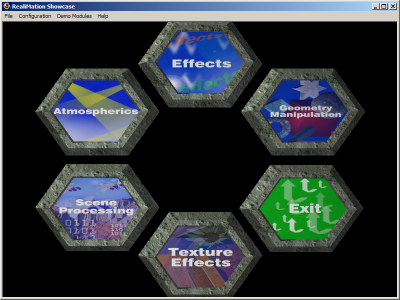 “Atmospherics” for example, and then again on one of the buttons in the subsequent screen (not Back!) to display the demo. Hit Esc to quit the demo. Next time: RealiMation the Datapath Years, Part 3. This entry was posted on 19 June, 2009, 11:44 am and is filed under RealiMation. You can follow any responses to this entry through RSS 2.0. You can leave a response, or trackback from your own site.